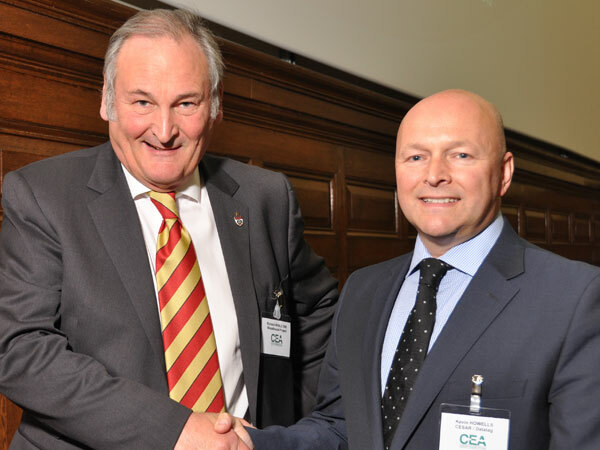 Datatag, the company behind the world’s most successful equipment security and registration scheme-CESAR, helped sponsor Richard Noble OBE, pioneer of the Thrust2 programme, to attend the recent CEA ‘Constructing the Future’ conference. Thrust2 held the world land speed record from October 1983 to September 1997. On October 4, 1983 the jet powered car reached a top speed of 650.88 mph and broke the record at 633.468 mph (average speed of two runs within one hour). 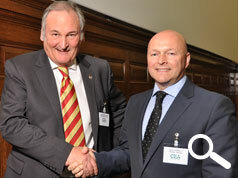 Noble is now the leader of the Bloodhound Project which is hailed as the engineering adventure for the 21st century! The Bloodhound SSC (Super Sonic Car) has been designed to run at speeds up to 1,050 mph. The car, which will be piloted by Wing Commander Andy Green OBE, will take part in the race to reach 1,000mph in South Africa, later this year. Continuing the connection to construction equipment, Wing Commander Green was at the wheel of the successful JCB Dieselmax that secured the world record for a diesel-powered car in 2006 averaging over 350mph. He had previously set the world land speed record when he became the first man to go supersonic on land at over 760 mph. The primary objective of the Bloodhound Project is to inspire the next generation to pursue careers in science, engineering, technology and mathematics by demonstrating how they can be harnessed to achieve the seemingly impossible, such as a 1,000+ mph land speed record.